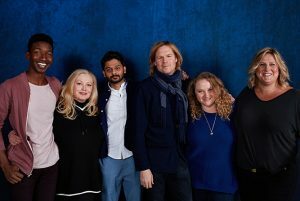 Patti Cake$, the debut film from writer-director Geremy Jasper ’98, has earned the second-highest deal of Sundance so far this year, with a bid of $9.5 million for distribution rights from Fox Searchlight. Producers are Dan Janvey ’06 and Michael Gottwald ’06; Matthew Greenfield ’90 is senior vice-president of production at Fox Searchlight—all Wesleyan film majors. The film premiered at Sundance’s Eccles Theater on Monday afternoon, receiving two standing ovations, rave reviews—and the Fox Searchlight deal. In tracing Jasper’s biography, from boyhood in a New Jersey suburb, O’Falt notes the similarity to that of the fictional Patricia Dombrowski. Hurricane Sandy in 2012 again brought Jasper back to parents’ house—this time to help with cleanup—and he began writing rap lyrics, along with the initial version of the Patti Cake$ screenplay. Accepted into the Sundance Writing Lab, with Quentin Tarantino as his first advisor, Jasper wrote nearly a dozen more drafts of his screenplay and was invited back to their Directors Lab.